June 10, 2018--Save the date! ​Chris Wise is a poet, novelist, and television host. He has published in various poetry anthologies and literary magazines such as Nerve Cowboy, Blue Collar Review, and Road Not Taken. He has been a featured author in Cowboys and Indians Magazine; he was a featured poet in the Huffington Post’s Video Reading series, and he appeared as himself in the animated comedy series The Damn Show. He currently serves on the committees of several organizations that promote poetry throughout the Houston area, as well as writing for, and hosting, the internet television show The Crawl on kh-tv.com (where he features Texas wineries, distilleries, breweries and events that promote them). His book Colliding with Orion (a non-traditional textbook on writing) was recently released by Weasel Press in July 2017. His full-length poetry collection Thirsty Earth is scheduled to be released in November 2018. He is a veteran of the US Army, earned an English degree from Texas A&M, and currently lives in Houston, TX. RSVP to the Colliding with Orion Book Release! Attention! Attention! Attention! This month & this month only The Best Lil Poetry House in Tx will be meeting on the 2nd Saturday, April 14, 2018 in Honor of National Poetry month. This month we will be featuring Chris Wise & Kool B! Don’t miss this amazing double feature! Hosted by Black Snow & Rain with DJ G woody nda mix! Drink & food specials all night long. Don’t tell a friend, bring a friend and get in there! Free for Poets, $10 to get in! We’d be honored to have your presence! READING: Red Sky: poems on the global epidemic of violence against women is an anthology edited by Houston poets Gabrielle Langley and Stacy Nigliazzo (and Austin Poet, Melissa Hassard). ​On Sunday, March 18, at 4:00 PM at Brazos Bookstore there will be a reading from the anthology featuring Houston poets Jane Chance, Carolyn Dahl, Gabriel Langley, Stacy Nigliazzo, Aleenah Spencer and Chris Wise (see bios below). The PM Show: Poets & Musicians is an electrifying collaboration between poets and musicians who combine their talents to create a rehearsed stage show at Rudyard’s. Poets and musicians invent new, original material for each performance. In 2018, there are three shows, hosted by improv poet James Trotter, each featuring four poets with different combinations of musicians. The shows open with the musicians performing, followed by the collaboration of poets & musicians and finishing with the musicians again. 2018 Show dates are on Thursdays, January 11, March 29 and June 28 at Rudyard’s British Pub, 2010 Waugh Drive, 77006. Doors open at 7:00 PM. Show starts 7:30 PM. Food and beverage service available. It will be a short and jam-packed 50 minutes of high-velocity poetry performance. Come early to catch some music before and after the Poetry Block! Presented by Visionary Noise and Houston Free Thinkers. The Gulf Coast Poets proudly presents the Poets of Weasel Press. Weasel Press is an upcoming publishing house of beat poetry and energetic prose. 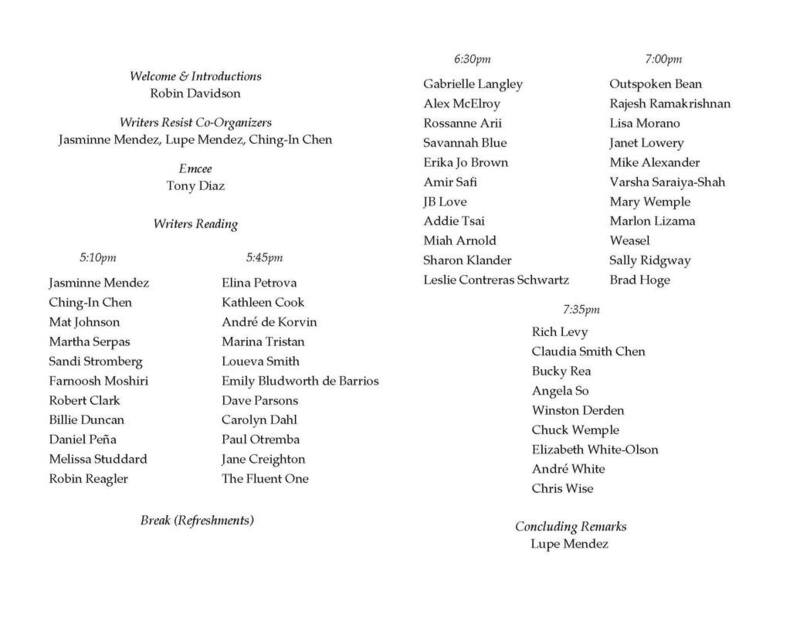 The poets will read from their works published by Weasel Press. It should be a great time for all. Poets are expected to include: Sendokidu Adomi, Chris Wise, Lulynne Streeter, Carolyn Dahl, Sandi Stromberg, Weasel Patterson, David E. Cowen, Ken Jones and Winston Derdon. Join us for lunch afterwards for a great discussion of poetry and good food. DESCRIPTIONFriends, I've lived another year, and it's time again for the Superstar Birthday Bash! Join me for a great night of poetry and spoken word. This year's superstar line up features Kool B, Savannah Blue, Marie Brown, Glynn Irby, and Sal Macias! And they've each invited two amazing poets to spot light! Joining us will be Josh Hayes, Tina Cardona, John Gorman, Rain, Stella Kendall, Kelly Ann Ellis, and others to be announced! All hosted by M.C. W. D Winston Derden! 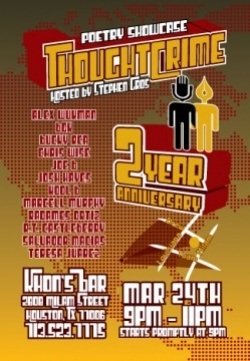 It's going to be a great evenign of fun and entertainment with some of the best poets I know! Don't miss it! Savannah Blue Arts & Outreach in partnership with The Houston Public Library for our inaugural Prince Tribute to include Poetry, Speed Painter, Musician and a DJ playing some of Prince hits. Poets: Rain Thepoet, Ahmad Hygh, Ebony IgnitedInk Smith, Chris Wise, and Rayla Crawford With our very own Houston Poet Laureate Deborah Deep Mouton performing, and Dr. Jimmy Adams, with Black Snow emceeing! KPFT's Living Art poetry feature for National Poetry Month, hosted by Mike McGuire and Bucky Rea! This edition of Soul Poetic features a great new band making serious moves around town, Let Me Remember. ​Chris Wise has invited a new bunch of amazing poets and Robert Kuhn closes out the night with a late set. It's gonna be a great night at Khon's!!!! Come by and feel with us! Dynamic poets and musicians combos in an all original show featuring Harry Shepherd with poet Billie Hill; Chase Hamblin with poet Mike Alexander; Free Radicals with poet Gerald Cedillo, hosted by Chris Wise. Open mic follows hosted by Amir Safi. For it's Tommy this, 'an Tommy that, 'an "Chuck him out, the brute!" ​The Balcony Poets is designed as a collaborative group of performance poets, musicians, artists, dancers, photographers, filmmakers and other creators. Currently, the group is a collaboration of poets, musicians and an artist. The Balcony Poets is not a group that is in lockstep. Each poet, artist, musician or other creative member has a vent, a style, an attitude all her/his own. Some of the poets are personal poets, some political, some satirical, some (most) a combination. We write in free verse, blank verse, formal poetry, etc. All shows are a combination of all our ideas and proclivities. Musicians who work with us range in style from jazz to classical to pop. The Balcony Poets emerged from a two-year series of multi-voice poems written by Billie Duncan and performed by her along with various other poets and entertainers. Duncan brought the idea of having a collaborative group of poets and other artists to Chris Wise, and they decided to form The Balcony Poets with all members contributing to the writing, performance, production and evolution of the group. Plans are in place to add dancers and other artists in the near future. Poets featured in Bad Hombres and Nasty Women, Part 2. Tex Allen feat. Chris Wise: "Remember when the Church Bell Broke"
Check out our new episode of The Crawl! The Moonshiner's Southern Table and Bar was awesome! ​Such amazing people with fantastic food and drinks. You're going to have a great time at this place. The manifestation kicks off at Super Happy Fun Land. 3801 Polk Street. 8 - 11pm. Touring band AMULETS (ATX) will be closing out tonight's show. ​An evening of music and poetry will be manifested. Poetry Fix features Maria Palacios & Chris Wiseon Tuesday, January 10, starting at 6:30 pm. An open reading & discussion will follow. ​Maria Palacios is a feminist writer, poet, author, spoken word performer, polio survivor and disability activist whose message of hope and empowerment pulsates and breathes through her work. Maria’s work has been featured in anthologies, articles, audio interviews and other multimedia publications. Known in the artistic world as The Goddess on Wheels, her multicultural background and passion for onstage performance have come to life through various events over the years. Her work embraces self-acceptance, empowerment and social justice surrounding women with disabilities, gender and sexuality and a wide spectrum of issues as they relate to diversity. Chris Wise is a poet and novelist. 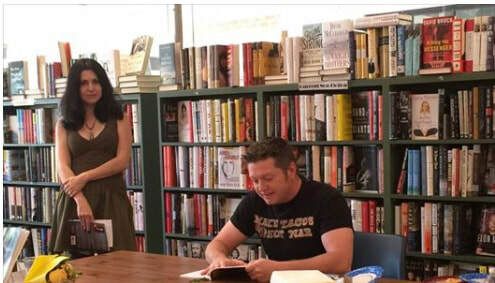 He has been published in various poetry anthologies and small press literary magazines such as Nerve Cowboy, Blue Collar Review, and Road Not Taken. He has been a featured author in Cowboys and Indians Magazine. His book Thirsty Earth (a collection of poetry, short stories, and essays on craft) from Weasel Press will be released in the fall of 2016. He is a veteran of the US Army and earned an English degree from Texas A&M. Come early as parking is limited & the coffee is good. Houston Hot Fusion: Poets & Musicians in the P.M. Speak!Poet rounds out its 2015 program with noted Houston poets Chris Wise and Anis Shivani. The event will be held Saturday, October 17, 2 p.m. at Inprint House, 1520 W. Main St., Houston, TX, 77006.Speak!Poet is the innovative poetry series that breaks the mold of conventional readings by presenting a moderated discussion with the poets on their work and its processes. The discussion includes audience participation. Speak!Poet is moderated by Winston Derden, who co-produces the event with Stephen Gros. The event is free and open to the public. ​Come to the Poetry Block at For the Community Festival! The Balcony Poets (Billie Duncan, Chris Wise, Winston Derden, Gerald Cedillo, Nigel Deane, Tuba Sozudogru) will be performing along with Deacon Khet, Salvador Macias, Zero Smythe, Jasmine Bustamante and Lyrical Symmetry. Hosted by Jade Villarreal. Saturday, March 19, 6:05-8pm. ​Chris Wise is back for a feature and this will be Becky Van Meter's first time featuring for us. It's National Women's Month, so maybe we'll hear female manifesto's on our open mic. Win our slam and you win cash! It's poetry in all it's diversity with Teresa Juarez as your MC this month. Also starring Brother Said. 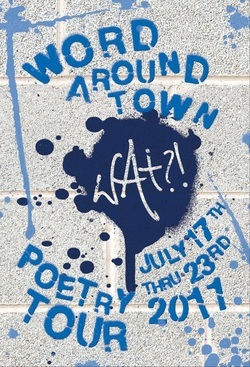 The Word Around Town (WAT) tour is an annual week-long poetry marathon held in Houston at a different venue each night of the week. The mission of the WAT tour is to introduce poets to different venues and to new audiences in the Houston area. Now in it's 8th year poets featured on the tour continue to range in styles from academic to slam and spoken word to experimental. The venues showcased on the tour are just as diverse from the local coffee shop to community centers, bars and non-profit institutions. The WAT tour exists to entertain while creating a forum for poets to find new audiences. Episode 1 of the Crawl is LIVE! 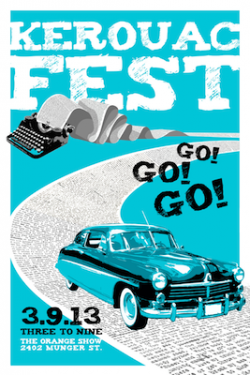 Produced by Tanyia Johnson of Make.Play.Speak and poet Stephen Gros, Kerouac Fest will include a rich lineup of performances, readings, panel discussions and in depth analysis of the Beat Generation. All content property of Chris Wise. Copyright 2018. Contact Chris Wise for permission to publish content.